We are entering the final two weeks of the season. Lots has happened in the past 24 weeks. The Yankees and Red Sox continue to be a cut above the rest of the AL East. The TB Rays have done remarkable despite really having only one viable starting pitcher. By the way, don't expect bullpen days to become a trend in the MLB. Most teams will still have five traditional starters that pitch 5-7 innings. The Orioles... not much to do here but laugh at their ineptitude. At the moment, the Blue Jays are kind of between the Rays and Orioles talent wise. A couple of years down the road, Toronto might be able to compete with Boston and NY. Last week, I started looking at each position and the depth the Blue Jays have with catcher, third base and first base. This week, I will take a look at SS, 2B and CF. Here are 10 random thoughts from week 24 of the MLB. 1. Not much in the way of injury updates this week. John Gibbons all but confirmed that Marcus Stroman is done for the year. Without rehashing my rant from last week too much, I will say it is the right decision. Of course Stroman hates missing starts, especially with the frustrating year he's had and knowing that he has to go through arbitration again for a new contract. However, there is no point in running him out there when he has maybe a start or two left and he's already missed a month and would need to build back up again. It's better to shut him down now, get that blister healed fully as they did with Aaron Sanchez. 2. Another pitcher who should be shut down is Marco Estrada. It is no secret that Estrada, who admitted this himself, is not healthy. He missed a month with a glut injury in July and came back pitched well in a couple of games but more often than not struggled and got knocked around. It's time to shut him down and get him healthy for next year. Estrada is a free agent after this season. I think he would be interested in coming back, but the team has Sean Reid-Foley, Marcus Stroman, Aaron Sanchez and Thomas Pannone and already and presumably they will kick the tires on a couple of the free agents. 3. OK, let's get right into analyzing some positions this week shall we? I will start at SS where things definitely did not go according to plan. Going into training camp, it was expected that Troy Tulowitzki would resume being the starting SS after missing the final 2 months of 2017 with a badly sprained ankle. However, Tulo came into camp with sore heels that would require season-ending surgery to remove bone spurs. 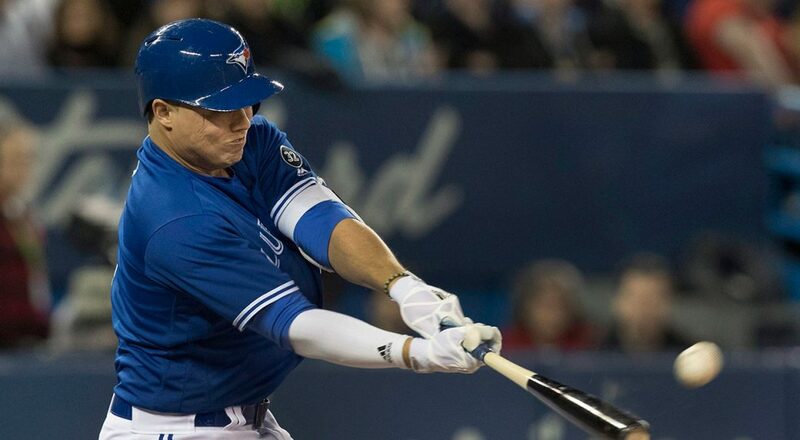 In Tulo's absence, the Blue Jays have used Aledmys Diaz, Gift Ngoepe, Gio Urshela, Russell Martin, Brandon Drury, Lourdes Gurriel Jr. Richard Urena and Yangervis Solarte for at least one inning at SS. Diaz has started the most games (93) and Martin played the least (3 games, 10 innings). None of the aforementioned players are a natural SS. As far as next year goes, there is a ton up in the air with respect to Tulowitzki's health. He tried to make it back this year but he effectively ran out of time with the minor league seasons ending. Tulo had progressed to running on flat ground after a few months on the anti-gravity treadmill. Assuming he can get back to full health, I suspect the team would like him back as the starting SS, but he may not be able to play everyday. Solarte will likely not be back with the team next year so playing time will likely be split between Tulo (if healthy), Diaz, Gurriel Jr. and Urshela. 4. Moving onto second base where the Blue Jays got some good news on the injury front. Devon Traavis was able to come back after a frustrating two seasons where he missed significant chunks of time with shoulder and knee injuries. The Blue Jays had him on a two days on, one day off schedule for the first couple of months. He struggled out of the gate, batting .148 in his first 18 games. He was demoted to Buffalo to work on his swing. Travis has managed to bring his average up to .236 after Sunday's game. Other Blue Jays who got starts/innings at second base this year were Yangervis Solarte, Lourdes Gurriel Jr., Richard Urena, and Brandon Drury. Assuming he is healthy, Devon Travis will get the bulk of the starts at second again next year with Gurriel Jr. or Urena backing him up. 5. Over in center field, Kevin Pillar started most of the games this year with Randal Grichuk playing as backup (Jonathan Davis also played three games at CF; Curtis Granderson started 1 game and played 2 in CF). Pillar's playing style puts him more at risk to hurt himself, as he did right before the all-star break diving for a ball and injuring his SC joint. Offensively, Pillar can be really hit or miss at the plate. While he doesn't strike out a ton (89 on the season) he is batting .246, which isn't a great average. Grichuk is more suited as a right fielder but he has done fine when filling in at center field. Pillar will be the starting CF next year with Grichuk likely backing him up again. 6. As expected, the Cleveland Indians were the first team to clinch their division. The Indians are the only team in their division that is above .500. However, Cleveland is far from a lock to win the world series. In intra-league games (no including interleague game) they are 28-35. If the playoffs started tomorrow, the Indians would be facing Houston and starting on the road. Their bullpen is not what it used to be and closer Cody Allen has been a shadow of himself. Health-wise, they have concerns with Andrew Miller's knee, Josh Donaldson's calves, Trevor Bauer's shin, Edwin Encarnacion's ankle, and Lonnie Chisenhall's calf. The one thing they have going for them, is having clinched a playoff spot they can rest key players and should be fairly healthy by October. Here is another reason not to put money on the Indians ending their world series draught. Only three teams have won the world series after clinching their division first. The Indians actually made it to the world series before losing in 1995, but that was a different team. 7. Here's some other stories to watch as we head down the stretch in the final 2 weeks of the season. Chris Sale pitched three innings today and threw some more in the bullpen Sunday. Assuming all goes according to plan, he should get 2 more starts and be able to go deeper each time so that by October he should be pretty close to where the team needs him to be to pitch deep in a game. As far as the Yankees go, I think they will be playing in the wild card game. Seattle or Tampa Bay would have to pretty much win out to catch the Yankees and have the Yankees lose a few games down the stretch. However, the Yankees having home field advantage in the wild card game is far from guaranteed. Currently, the Yankees hold a 1.5 game lead over the A's with both teams losing 2 of 3 on the weekend. NY has a massive series against the Red Sox starting Tuesday. Should Boston win 2 of 3, the AL East title will pretty much be theirs. Oakland has an easier schedule than the Bronx Bombers the next 2 weeks facing the Angels 6 times and Seattle and Minnesota three games each. The Yankees have to face the Red Sox 6 games, Baltimore three games and Tampa Bay 3 games. Tampa Bay faces Toronto 6 games, NY and Texas three games each. The wild card teams might be known after this week, but it will likely be the final weekend before we know where that game will be played. Do it Chicago Cubs, trade for a reliever. You only have a 2.5 game lead over the Milwaukee Brewers for the division lead and you don't want to face a wild card game. The LA Dodgers will be fine. They have too many good hitters not to overcome the offensive woes they are facing. Maybe Oakland should worry about clinching the wild card game before worrying about who will start that game. Crazier finishes have happened and Oakland could still miss the postseason. Carlos Martinez closing for the Cardinals would be absolute vindication for him after an injury riddled season. However, if the playoffs started today, the Cardinals would miss out by half a game. 8. Atlanta is looking like it will clinch the NL East and they have the potential to do some damage. The Braves have a younger team led by rookie Ronald Acuna Jr. Ozzie Albies and 25 year old ace Mike Foltynewicz. One major question mark is the struggles of veteran Julio Tehran who is 9-8 with a 3.97ERA, He could get left off the playoff roster if the Braves don't think he can win in a short series. If the playoffs started today, Atlanta would be hosting the Dodgers. 9. Hailey Dawson threw out the final first pitch today to complete her journey of throwing out a first pitch at every MLB ballpark. She threw out the first pitch in Toronto back on August 8th. It was really cool that former MLB pitcher Jim Abbott, who was missing his right hand, was on hand today to witness and celebrate this cool feat that began in Baltimore August 17, 2015. Kudos to the other 28 teams for arranging for Hailey to throw out the first pitch at their ballpark. 10. Blue Jay of the week: Aledmys Diaz who had a huge 3-5 effort vs. the Yankees Saturday, driving in 3 runs and scoring 2 more.